Who? Oh yeah, that’s me, Suzanne. And Susannah. Suzanne writes urban fantasy and paranormal fiction. Susannah writes dark paranormal romantic thrillers. Yeah, I kind of made that genre up. Take a thriller, stir in some romance, add a few dashes of shapeshifter…and there you have it. So I’m here to talk a little about Storm Force, which came out yesterday in print after an initial release as a serial novel. That means, basically, it has a LOT of conflict and tension and nail-biting scenes. When I began writing my Penton Vampire Legacy series, I learned a couple of surprising things about myself as an author: that I like writing action scenes, and that I REALLY like writing bad guys. So welcome to Houston and to the Louisiana swamps, where a mixed team of human Army Rangers and military-trained shape-shifters (an eagle shifter named Robin and a pair of black jaguar-shifters) get drawn into an ecoterrorism case that embroils them all in a paranormal power-struggle for which they’re totally unprepared. ABOUT STORM FORCE – As leader of the elite counter-terrorism team Omega Force, former army ranger Jack “Kell” Kellison is always focused on getting the job done. So when a Houston high-rise is bombed and the governor killed or missing, Kell’s mission is clear: infiltrate the group suspected of the bombing and neutralize the threat by any means necessary. But once Kell meets beautiful chief suspect Mori Chastaine, he realizes there’s more to this case than meets the eye. And more to Mori than any man—any human man—could imagine. 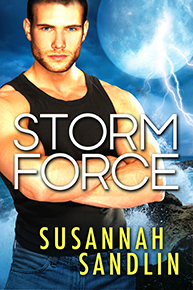 I’ll be giving away a choice of print or ebook of Storm Force to one commenter! 🙂 Just let me know the worst bad guy you’ve ever loved to hate! Tags: Paranormal fiction, Paranormal romance, paranormal thriller, Penton Vampire Legacy, shapeshifters, Storm Force, Susannah Sandlin, Suzanne Johnson. Bookmark the permalink. i did hate michael but i think it will be worse with Rand since i read so little about him yet ( will read more in matters of hours normally) but i still have all red flags and instinct pointing him as bad, really bad!!! LOL. Rand does some good things in Elysian Fields. And Rand does some really bad things in Elysian Fields. So maybe don’t hate Rand but certainly don’t trust him–ever! You’re right about Gollum. I felt sorry for him in the beginning because he really was a victim…but then he lost anything was what was left of his “humanity,” so to speak and it was hard to pity him. I think Suzanne is right about Steven King. Bad guys in his books are really easy to hate. The story Misery comes to mind with a female bad guy, Annie Wilkes. The first thing I thought of though was Kim Harrison’s Hollows series with Al and Trent. I’ve not liked Trent since that mink thing. Yes, Stephen King does such good bad guys! Ah, Roger, we’ll never agree on Trent Kalamack. I love him because he’s such a contradiction; he often has good motives for doing things, but absolutely no ability to understand limitations or take into consideration what his actions mean to other people. I always liked Al, but never considered him a sympathetic character until the last couple of books. I like that Kim Harrison is able to give these characters such depth, even after X number of books! I think Valdemort is still the main villain for me. Although the Omega in the Black Dagger Brotherhood really creeps me out too! Omega is super-creepy. In fact, now that I think about it, he might be at the top of my current creep list! Ooo I agree, I kept expecting Dumbledore to come back from hiding too. But I guess he was really dead. Dr Whitney from the Carpathians by Christine Feehan. A psychopath who is convinced he is doing everyting for the good of mankind. So creepy and soulless. I really need to give the Carpathian series another try–I only read the first one and the “head-hopping” point of view shifts drove me nuts. But I liked the story and characters….and obviously there’s a serious bad guy! O my bad, wrong series. That should be the Ghostwalkers with Dr. Whitney. But yes, the Carpathians also have a very bad guy (mage) who tries to kill them all, beginning with their pregnant women and babies. That does become clear much later in the series though, and then the fight against him begins. Hi Suzanne! I recently read the first chapter of Storm Force and look forward to having time to read the rest! Bad guy I love to hate = Lothaire. So enjoyed his naughty ways throughout K. Cole’s Immortal After Dark Series and then was one happy reader when Cole gave Lothaire his own book. Woot! From television from Xena: Warrior Princess: I loved Callisto — such a tragic bad girl and Xena’s archenemy.